Catapult returned to the high Yorkshire moors for the penultimate TT event of 2016, on Grimworth Reservoir, home of Yorshire Dales SC and home waters for Stuart and Gareth Ede. A good fleet shared the weekend with the D-Zero's, an easy mix. The breeze stayed firmly NE, chilly except in the bursts of sunshine on Sunday. 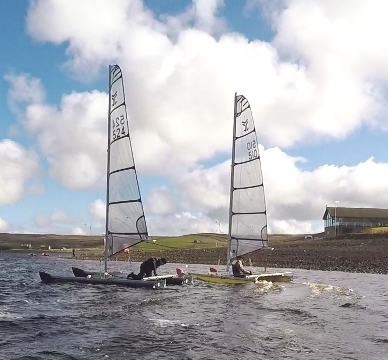 The breeze angling across the reservoir dictated courses back and forth with short upwind legs, still enough to set some tactical puzzles as the breeze swung, or shifted with the shore features. On Saturday, for three back-to-back races the RO laid a great course, a twisted figure-8, with two beats.The first beat into the NE corner of the lake had wind fanning out of the small valley, with the chance of finding advantages, but taking the shifts and spotting the gusts stayed difficult. In Race one from a tight start John Terry chased by Gareth Ede and Alistair Forrest rounded ahead. In the long flat run, gybing back and forth, the rest of the fleet pulled up, and by the end of lap 1 the order was John, Gareth and George Evans. Lap 2 saw close racing with some gaps opening up but then closing down as lifts and gusts were taken advantage of. (Below: George Evans, right, squeezes past Chris Phillips and chases Stuart Ede, Race 4, in Sunday sunshine. 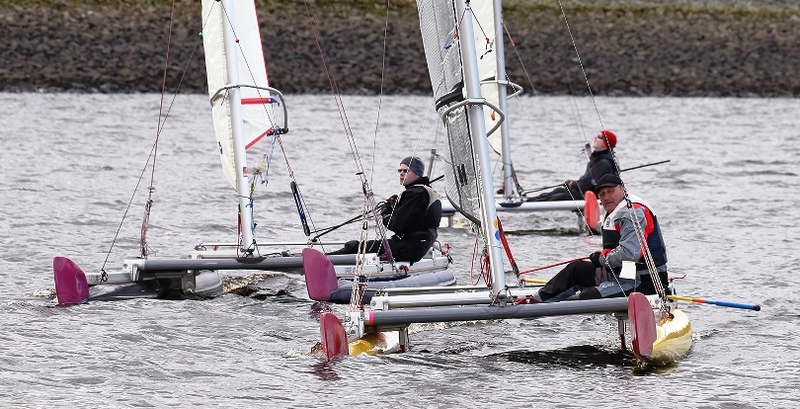 On first beat of the final lap, John with a lead of over 200m on Gareth, had his mast control line un-cleat, and in the stiffening breeze the time taken to right his mast and reach the mark let Gareth take advantage for the lead. Gareth finally crossed the line 20secs ahead, with George not far behind John. Behind, Syd Gage pulled steadily up through the fleet, but confusion at the finish line (straddling the downwind mark) let Alastair through for fourth. For Race two Stuart Ede picked the port end advantage successfully, but this took him out to the right of the beat,and this time the shifts went against that side. On the right John Terry chased Gareth up ahead with the rest of the fleet. Chris' and Alastair's contest for third was disrupted by George Evans coming through, and he finally broke away for the third place. Gareth kept his lead all the way round with John Terry only a short distance behind, trying options of splitting up the middle of the lake on a couple of laps, but still just unable to get past.They both pulled out ahead of George, and at the finish there were 15 secs between Gareth and John, with George 2.5 mins behind leading the middle of the pack. 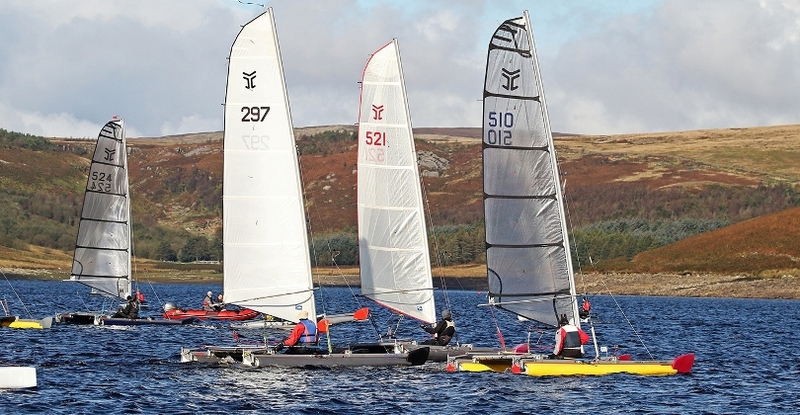 Race three kept the same course, and the starboard end starts were tricky with the start close to the shore. 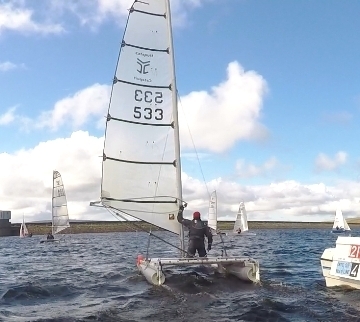 Stuart Ede successfully defended the starboard end, and pushed Alastair up and past the committee boat. At the front, it was close again between Gareth and John, with places swapping a couple of times. George came through the fleet quickly to threaten the leaders, and John won a close finish followed by Gareth (25secs) and George 45 secs behind. Syd Gage showed steady up wind speed to comfortably take and hold fourth. Meanwhile Chris Phillips� upwind speed let him chase Gareth hard round the top mark and downwind, ahead of Alastair. George came up to battle Alastair before moving out for a comforatble second, and Alastair held off Chris for third. Half way up the second lap the wind dropped to a few mph and shifted around in circles for half the length of the windward leg, with only just enough wind to keep momentum at times. John followed the breeze into the middle of the lake, building a good lead, only to see Gareth taking the north shore route get the new wind filling in. It was heart in the mouth sailing with just about 50mts between them at the mark. One more lap and they were neck and neck all the way round, and down the final reach to the leeward mark and the short dash to the line. Gareth got the inside overlap forcing John to give him room, but John managed to get inside after rounding and with a favourable gust pipped him at the post by only 5 seconds. Again George showed good speed upwind to follow in about a minute after for another third, with Stuart taking fourth. The fleet took a comfort break, and the breeze as well was invigorated, with dark gusts giving advantages when they could be caught. The Race 6 start was back to having a port end bias, but John trying to cross on port was caught by Gareth Stuart and Alastair surging down to that end. Alastair chased Gareth until he moved out in front, and George came up steadily to take another second place, with John coming back up through the fleet to regain third. Alastair carefully tied Stuart into his dirty wind for the beats to just defend fourth.